A socio-cultural group in Nigeria’s Niger Delta, The Movement for the Survival of the Ogoni People, or MOSOP, is commemorating the execution of leader and author Ken Saro-Wiwa and eight others over a decade ago. They were hanged at the Port Harcourt prison on Nov. 10, 1995 by the military government of General Sani Abacha. MOSOP recognizes their deaths as part of the fight for justice. Mitee said Ogonis are not happy with the failure to implement the United Nations Environment Programme (UNEP) report on the environmental degradation of Ogoni land. The UN agency submitted the report to the Nigerian government three months ago. 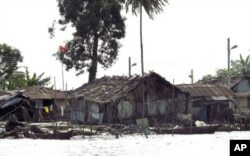 In the Niger Delta region, multi-billion dollar oil installations sit among villages of shacks perched on stilts over viscous, blackened water. Among its findings were that public health is threatened in at least 10 Ogono communities by high levels of hydrocarbons. It found that the drinking source of one community contained up to 900 times the recommended levels of the carcinogen benzene.